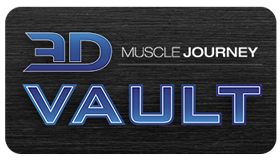 As some of you know I am feverishly working very close with the team at 3DMJ on a “Deload and Tapers Guide.” Good news is that we are coming close to finishing. This month I made a discovery via coaching one of my athletes that is so good, it is worth adding to our book. Classic Thinking: The De-Load is the Perfect Time to Polish Up Form and Increase Range of Motion. On paper, this does seem to make sense. In fact all of us as coaches have told our athletes that this is a good time to clean up form and make sure they are not using too much momentum, cheating or moving the weight with other than the intended working muscle. However, if every repetition ends up looking totally different and overly strict, compared to what is normally done, what ends up happening is the exact opposite of what we are intending the deload to do. That being, dropping overall volume. The Problem: Increasing Range of Motion and Super Slow Sets In Essence Increases Unquantifiable Volume. Many of the classic “intensity” techniques like drop sets, super sets, and pause sets, do work, don’t get me wrong. But, they also are very hard to quantify in terms of volume. They often occur in a fatigued state, and use that fatigue to make light weights more effective than they normally would be. While these techniques can stimulate hypertrophy, they do make it hard to track progressive overload. Likewise, if a set lasts 15 – 20 seconds normally and you increase range of motion and slow down repetition speed so that it lasts twice as long, how can we compare the two? Time under tension has increased, while load has maintained, meaning in an unquantifiable way (because it wouldn’t show up in sets x reps x load), the volume per set has almost doubled, which has negated the intended reduction in volume we normally prescribe by reducing a set per exercise. The Take Home: Be Careful About Unknowingly Maintaining Or Increasing Volume During A De-Load. This all came about when one of my athletes checked in after a de-load week. The report was the athlete was sorer, and felt more “beat up” than the week prior to the de-load. Naturally I gave a crooked look and put my detective hat on. The response was that since some sets were only 2 sets of 3, and high rep sets were 2 sets of 8 it did not “feel” like there was much work or benefit to it. So, to make up for this the athlete went deeper on squats and leg presses, paused on bench presses, deadlifts and rows, and did very slow repetitions on isolation movements to really focus on the muscle moving the weight. So, each squat and leg press had an additional 2 to 3 inches added to the range of motion, which you guessed it, equals more volume. Each pause on bench presses, deadlifts, and rows made each repetition last a half second longer which, again, equals more volume. The reduced speed of each isolation movement made each rep last longer which made the set last longer, and since load was maintained or slightly increased, meant more volume. Our attempt to reduce volume, which of course is done to reduce fatigue, was offset by an actual increase in volume by making all the work take longer. The only instruction this athlete did follow was to increase all loads slightly, which normally would not have been a problem when volume via reps and sets dropped, but in this case added even MORE volume. So, what was the solution? To repeat the de-load week again, reduce loads slightly, but this time to do every repetition in the exact same fashion they are usually done.